With its legal and physical protection, right of way fence prevents encroachment, preserves right of way and provides safety for travelers. It is not the intention of this policy to provide fencing on an indiscriminate basis since all fencing provided by the plans is to be maintained by the state. Fencing is normally placed in highly developed areas and where it is desired to prevent encroachment and pedestrian crossing of the right of way. Maintenance forces would not normally be expected to erect the access control fencing discussed in this policy. At isolated locations, effective control can be achieved with a minimum of work through minor grading, ditching, placement of posts, etc., and is preferable to the development of extensive control by fencing. A printable Maintenance Planning Guideline for Fences is also available. 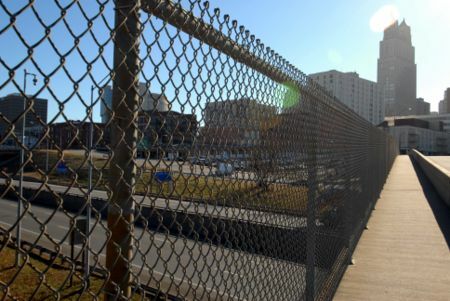 This article addresses how fencing is to be indicated on the project's plans. Fencing applications consist of woven wire and barbed wire fence 54 in. tall for rural and some suburban areas, and chain-link fence minimum 60 in. tall for urban and suburban areas and other developed areas where pedestrian control is desirable. Chain-link fence shall be used through the limits of rest areas. Where outer roadways are provided, the use of one-strand access restraint cable (for access control only; see Standard Plan 606.40) may be considered as a substitute for fencing at the access control line when the primary purpose of fencing is to prevent vehicular movements. Completed sections of interstate highways are to be reviewed and fencing provided in accordance with this criteria. Fencing is to be placed regardless of previous compensation for fencing to property owners. All fencing should be maintained by district forces in the manner it was originally constructed. The fencing should be kept free of litter and weed growth. Fencing for other fully limited access highways is to be determined on each project's needs but generally will not be required. Where generally acceptable private fences exist, they may be utilized to develop the necessary continuous fencing but maintenance of private fencing shall remain the responsibility of the property owner. This page was last modified on 29 October 2018, at 08:50.